The Tarantula is situated 170,000 light-years away in the Large Magellanic Cloud (LMC) in the Southern sky and is clearly visible to the naked eye as a large milky patch. Astronomers believe that this smallish irregular galaxy is currently going through a violent period in its life. It is orbiting around the Milky Way and has had several close encounters with it. It is believed that the interaction with the Milky Way has caused an episode of energetic star formation - part of which is visible as the Tarantula Nebula. Just above the centre of the image there is a huge cluster of very hot stars called R136. The stars in R136 are also among the most massive stars we know. R136 is also a very young cluster, its oldest stars being "just" 5 million years old or so. Its smallest stars, however, are still forming, so astronomers observe R136 to try to understand the early stages of stellar evolution. Near the lower edge of the image we find the star cluster Hodge 301. Hodge 301 is almost 10 times older than R136. Some of the stars in Hodge 301 are so old that they have already exploded as supernovae. The shockwave from this explosion has compressed the gas in the Tarantula into the filaments and sheets that are seen around the cluster. 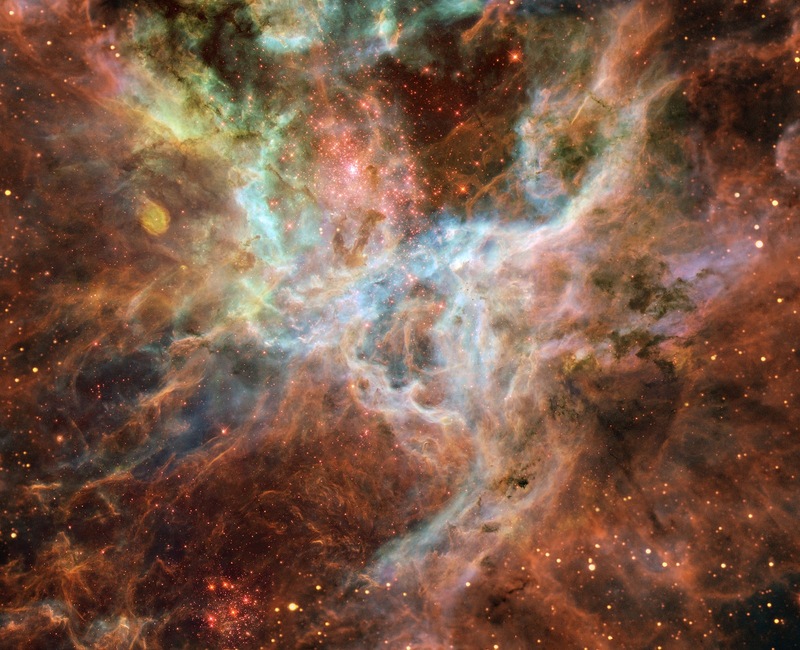 This mosaic of the Tarantula Nebula consists of images from the NASA/ESA Hubble Space Telescope's Wide Field and Planetary Camera 2 (WFPC2) and was created by 23 year old amateur astronomer Danny LaCrue. The image was constructed by 15 individual exposures taken through three narrow-band filters allowing light from ionised oxygen (501 nm, shown as blue), hydrogen-alpha (656 nm, shown as green) and ionised sulphur (672 nm, shown as red). The exposure time for the individual WFPC2 images vary between 800 and 2800 seconds in each filter. The Hubble data have been superimposed onto images taken through matching narrow-band filters with the European Southern Observatory's New Technology Telescope at the La Silla Observatory, Chile. Additional image processing was done by the Hubble European Space Agency Information Centre. thats amazing how vast that is i could not image seeing it up close it would be ther no words to describe it.